Tees from Ø 219 - 1420kh22-1220kh22mm. During projecting and construction of pipelines of different function, as a rule, there is a question of need of a turn of a stream. Implementation of adjustment on the site represents very complex and labor-consuming challenge for this reason any construction of a heating main or the pipeline does not do without use of welded steel branches. This product substantially allows to reduce time expense for construction and in general to cut expenses. In most cases at production of branch sector for cutting of preparations the same pipe from which the main pipeline gathers undertakes. However in case diameter of communications exceeds 500 mm, increase in thickness of a wall of steel sector branch is required. It is connected with the fact that on angular sites internal tension significantly increases: when using metal of the same thickness there is a risk of destruction of branch. Withdrawal of Ø of 219 - 1620 mm - GOST 30753 of the 2D type, GOST 17375 of the 3D type, OST 36-21-77, OST 34-10.752-97. Corner 15 °, 30 °, 45 °, 60 °, 90 °. At installation of pipelines pipes of different diameters, for their connection among themselves are used, apply various fitting — tees and welded transitions. In most cases, at installation of pipelines transitions welded steel, made of the carbonaceous and low-alloyed steel, allowing to maintain pressure to 2,2 MPas and temperature to 425 C are used. In case increased requirements to environment parameters are imposed, transitions corrosion-proof which are made from corrosion-proof (korozionno-resistant) steel are applied. All welded transitions are made according to requirements of the specifications and technical documentation which, in turn, determines parameters of the environment and the field of their application. So, according to OST transition from the low-alloyed steel can be established on the oil pipeline or the gas pipeline, and from carbonaceous — only on a heat conductor. Transitions for pipes represent a detail which is intended for connection of the pipes having various diameters of the pipeline. When it is required to change stream speed. Ø 426x10-159x6 transitions - 1600kh1400kh16mm. 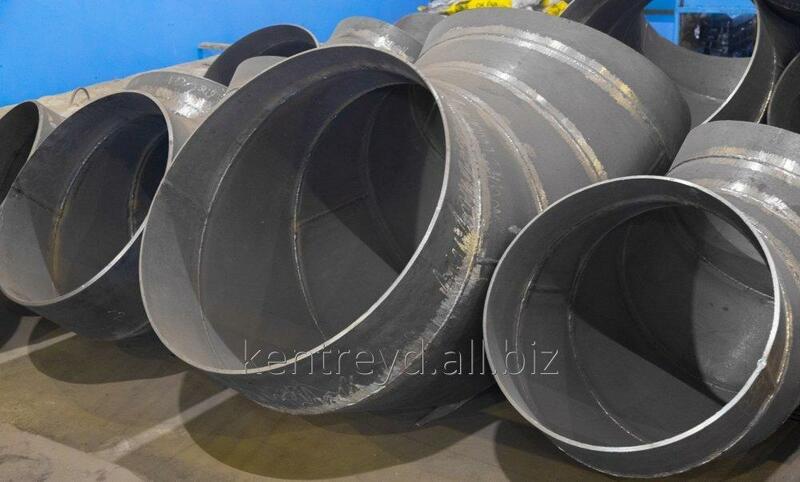 Transitions welded sheet concentric OST 34-10-753-97 and OST 36-22-77. Transitions steel seamless GOST 17378.
the first are used for vertical pipes, the second - for horizontal. For the order fill a form below. Specify presence of necessary diameters and the price at our managers. Tee steel - the irreplaceable connecting detail used practically in all industries, laying of pipelines, systems of heating and water supply. This detail received such name thanks to the design from three openings or branch pipes to which attach additional pipes. So, by means of such tee it is possible to create branched systems of pipelines. The tee of ravnoprokhodny has a side branch same, as at the main pipeline. The tee of transitional has a branch with a smaller diameter of conditional pass. From Ø 219 - 1420kh22-1220kh22mm. Tees welded ravnoprokhodny OST 34 10.762-97. For pipelines of thermal networks application of welded ravnoprokhodny tees with working pressure up to 4,0 MPas (≤ 40,0 kgfs/cm2) is allowed, at a working temperature to 350 °C. Tees welded transitional OST 34-10-764-97. Tees steel seamless welded GOST 17376. Are used with a pressure up to 16 MPas (160 atm) and temperature of a working environment from -70 °C to +450 °C. On our website not all positions are declared and not all prices for products which we can offer you, a request are specified to address by the contact phones specified on the website or, fill a form with your question. Specify presence of necessary diameters and the price at our managers. Unbelievable price on Branches, Tees, Transitions. in Dnipro (Ukraine) company KenTrejd, OOO.